CHICAGO (CN) – Two mothers and one grandmother filed a federal class action Wednesday claiming Illinois’ lack of regulations to curtail gun trafficking disproportionately affects kids in black communities. The complaint, filed in Chicago federal court by the guardians of three African-American children, accuses Illinois, its Department of State Police and Governor Bruce Rauner of violating the Americans with Disabilities Act and the Illinois Civil Rights Act. The plaintiffs in the case are represented by Michael Persoon of Despres, Schwartz & Geoghegan. According to the complaint, 40 percent of guns used in firearm-related crimes in Chicago are purchased at gun shops in suburban areas surrounding the city. It names seven specific gun dealers in Riverdale, Lyons, Lincolnwood, East Dundee, Melrose Park, Lansing and Posen. “Under current law, and without cost, the Illinois Department of State Police can adopt reasonable regulations that would curtail the gun trafficking by these shops, and thereby reduce the gun violence in Chicago, and in turn reduce the terrible effect such gun violence has on the African-American children bringing this case,” the lawsuit states. The epidemic levels of gun violence in Chicago are well-documented. The complaint quotes figures from the Chicago Police Department and University of Chicago Crime Lab showing that between Jan. 1, 2015 and June 30, 2018, there were 2,231 people murdered in the city – 90 percent of those cases were gun-related. In 2015-2016, according to the Crime Lab, 80 percent of Chicago homicide victims were black, even though African-Americans make up only about one-third of the city’s total population. This trend has been found to continue into the first seven months of 2018. Each of the plaintiffs in the suit has lost at least one family member to gun violence. The children of Demetria Powell and Tanya Reese and grandchild of Tywanna Patrick have all been diagnosed with post-traumatic stress disorder, according to the complaint. The gun-violence epidemic in Chicago raises the questions: where are all the guns coming from, where are they going and how is that traffic regulated? The complaint says, for example, that since 2011, each year Chicago police have recovered from the streets about 7,000 “crime guns” – firearms that were illegally possessed, used or suspected to have been used in furtherance of a crime. 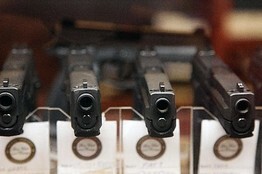 Illinois gun dealers, by law, must be licensed by the Bureau of Alcohol, Tobacco and Firearms. However, the lawsuit alleges the ATF does little to monitor or control the sale of guns in these stores. Federal law prohibits the ATF from requiring federally licensed gun dealers to submit to regular firearm inventory inspections. The lawsuit says state officials have broad authority to adopt regulations to help curb the problem. The Department of State Police, for example, is charged with enforcing the Firearm Owners Identification Card Act, which screens potential gun owners before they can be eligible for an FOID card, which is necessary for legal gun ownership. Nevertheless, the plaintiffs claim the state has yet to adopt meaningful regulations that keep guns out of the hands of those not licensed to own them. As a result, more and more “crime guns” flood into Chicago and fuel the gun-violence epidemic taking place in mostly black neighborhoods across the city, according to the lawsuit. The complaint outlines several steps that could be taken now without any changes to Illinois law. They include conducting background checks on all gun store and gun show employees; not allowing the sale of guns to people who the seller knows will quickly transfer ownership of the weapon; and preventing those linked to “crime guns” from buying another gun. The plaintiffs seek a declaratory judgment that Illinois has violated the Americans with Disabilities Act by not making a “reasonable accommodation to the special needs of the plaintiff children in the conduct of the federally assisted law enforcement programs,” and violated the Illinois Civil Rights Act by not controlling the gun trafficking that primarily impacts black children. The mothers and grandmother also want an injunction requiring the Department of State Police to adopt reasonable regulations to address the problem. Their attorney, Persoon, did not immediately respond Thursday to a request for comment. A spokesman for the Illinois State Police declined to comment on the pending litigation.